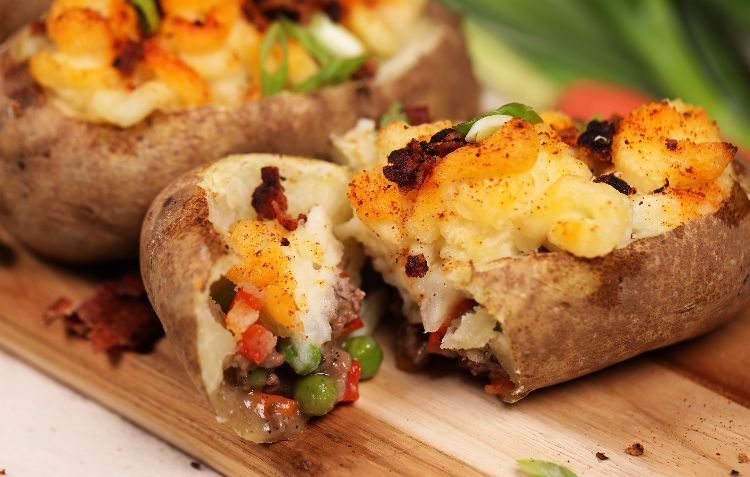 There may be a few steps to this culinary delight but just think of it as a potato adventure! First, you will first need to bake russet potatoes off, using a knife cut off the top and scoop out the filling. Make sure to use Idaho or Russet Potatoes in order to achieve a nice fluffy mash. Next, cream and butter them up to make mashed potatoes. Meanwhile, make your beef filling in a large skillet. Adding flour will thicken up the mixture to make a wonderful gravy. Finish off the filling with traditional Shepherd's Pie veggies of peas and carrots. Now it's time to build your creation. Add the meat filling right into the hollowed out potato skins and top with the mashed potatoes. You can use a piping bag with a tip for a fancy presentation or if you don't have one you can just spoon it right on with a spoon. Finally, bake off and serve! Enjoy! On a baking sheet, bake potatoes for 45 minutes to 1 hour or until it is tender. Cool to room temperature. Cut top of baked potatoes off, lengthwise. With a spoon, scoop out inside of cooked potatoes, leaving about ¼ inch along the inner walls. Discard the top. In a bowl, combine cooked potato filling with butter, ½ tablespoon salt and heavy cream. Mash until everything is combined to make mashed potatoes. Place into a piping bag. In a large skillet, heat oil to medium high heat. Brown and break up ground beef. Add onion, bell pepper, Italian seasoning, remaining salt and pepper and cook for 5 minutes. Sprinkle in flour and cook on medium low for 5 minutes. Add beef broth and bring to a simmer. Cook for 5 minutes. Add in peas and carrots and simmer for 5 minutes. Fill each hollow potato skin half way up with the beef filling. Pipe a layer of mashed potato into each potato skin. Dust with smoked paprika. Place onto a baking sheet.